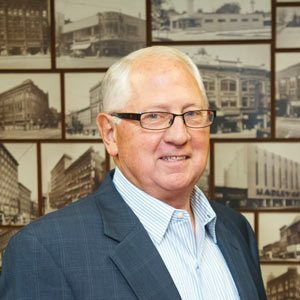 Bob Hudson is a well-respected professional in northeast Indiana’s commercial real estate arena with more than 41 years experience and over $600 million in successful real estate transactions, including the disposition of over 100 apartment complexes in the Fort Wayne area. Before coming to BND, Bob was the owner / principal broker for Hudson Investment Realty Company and more recently served as local managing director of a national commercial real estate firm where he specialized in the sale of multi-family housing. Bob has a Bachelor of Science degree in business administration and accounting from Indiana University and is a proud veteran with an Honorable Discharge from the U.S. Army. Bob is a past recipient of the coveted Certified Commercial Investment Member (CCIM) designation and is a member of the Indiana Commercial Board of REALTORS, the National Association of REALTORS, the Indiana Association of REALTORS and the Fort Wayne Apartment Association. In addition, Bob serves on committees of Faith Lutheran Church. He previously served on boards for the Boy Scouts of America, and Wings of Hope, a prison ministry for women. He was a member of the Fort Wayne Downtown Rotary, and is a past president of the Downtown Sertoma Club. He and his wife, Sheila, have three children and four grandchildren.